Caring for a loved one who is suffering with dizziness, vertigo, imbalance or unexplained repeated falls? You are in the right place! Dr. Bell is here for you. You are NOT alone. We can direct you to the proper care and guidance for your situation to help you experience comfort and relief. Call 760-652-9993 or contact us to schedule your Initial Root Cause Physical Therapy Evaluation and Treatment Specialty Consultation today. “A major PLUS to your treatment is a huge reduction in my anxiety when riding in the car. I had been blaming my husband’s driving! Do I need a physician’s referral to be seen by Dr. Bell or her team? No. California has a Direct Access to Physical Therapy Services law that allows patients to be seen by a physical therapist without a referral for up to 12 visits or 45 days, whichever comes first. If you require further care, then a physician’s referral is required. Physician referrals and medical diagnostics are not necessary, but are valued and welcome. How should I prepare for my private consultation? This unique specialty service is designed to offer high quality, individualized Assessment and Rehabilitation Treatment for Vertigo, Dizziness and Imbalance in the privacy of your own home or hotel room. Book your Initial Root Cause Physical Therapy Evaluation and Treatment Specialty Consultation online, by email or by phone. Call 760-652-9993 to book by phone. Gather a list of all your medications, including prescription drugs, over-the-counter, supplements and herbs. Expect a phone call from Dr. Bell to review your medical history, symptoms and current complaints before the in-person house call appointment. If requested by Dr. Bell, complete the New Patient Intake forms and the 25+ page History Taking Form prior to your in-person consultation. Be sure that you have reported your condition to your doctor because your primary care doctor may want to do his or her own exam. Invite a family member, caregiver or close friend to join the consultation to take notes for you or film the consultation so you don’t have to remember everything that Dr. Bell explains and teaches you by yourself. Eat a light breakfast and drink a glass of water on the morning of the consultation. Do not take any vestibular suppressant medication on the morning of the consultation. Common vestibular suppressants that your doctor may have prescribed include meclizine and scopolamine. Plan your schedule so that you can take it easy for the rest of the day after your initial consultation. The hands-on evaluation will trigger your symptoms so that Dr. Bell can assess the extent of your condition and make appropriate recommendations. Although she will skillfully manage your symptoms throughout the evaluation, you may still feel tired afterwards and need extra rest. You should not plan to do household chores, return to work, read, drive or cook your own dinner that evening. Some people feel absolutely fine afterwards, but some need to take it easy for the rest of the day. Dr. Bell and her team members kindly requests that a spouse, family member or caregiver be present for the evaluation of any patients with confusion or memory loss to assist with the evaluation and support the treatment plan. Please secure all pets before Dr. Bell arrives so your pets do not cause an interruption to the visit or interfere with your care inadvertently. Plan for a follow up phone call with Dr. Bell to review your response to the treatment, discuss your progress, review the exam findings, go over suggested next steps, and provide further instructions and resources. What does the Initial Root Cause Physical Therapy Evaluation and Treatment Specialty Consultation include? The private specialty consultation is designed for you to have a total of 3-4 hours of time and directed attention from Dr. Kimberley Bell, DPT in order to thoroughly investigate your case and discover possible root causes for your discomfort. After you book your appointment for Initial Root Cause Physical Therapy Evaluation and Treatment Specialty Consultation, Dr. Bell will call you to review your medical history, symptoms and current complaints for up to 30 minutes before the in-person visit at your home or hotel room. Depending on your individual case, Dr. Bell may ask you to fill out a 25+ page History Taking form before the in-person visit. Dr. Bell will come to your home or hotel room to complete a comprehensive, detailed Root Cause Physical Therapy Evaluation and initial Physical Therapy treatment, both in the first visit. This is a high complexity physical therapy evaluation, so the initial visit may last for up to 2-3 hours, depending on the exam findings. Dr. Bell will schedule a follow up phone call with you to review the findings of the Physical Therapy Evaluation, the results of the initial treatment, considerations and suggested next steps, including free online educational resources, The Bell Method multimedia e-courses for purchase that are relevant to your specific case, any instructions given for appropriate exercise and self-care strategies, recommendations for appropriate assistive devices or equipment, and recommendations for further physical therapy services with our team or consultations with other specialty healthcare providers. This Specialty Consultation service is unique in healthcare due to the extensive time Dr. Bell will spend investigating your case and personalizing your treatment plan, and includes a detailed interview, hands-on clinical assessment and treatment via “The Bell Method” strategies. This consultation service is also offered by The Bell Method Vestibular Team Leader, Janet Troche, PT at a lower cost. What are some other benefits of consulting with Dr. Bell privately for my case? How many visits will I need with Dr. Bell? Dr. Bell and her Team Leader see private patients anywhere from 1-10+ times, depending on what you need and how complex your individual case. Patients see Dr. Bell for 2-3 visits on average for an episode of vertigo, but every case is different and each person has unique causes and solutions for their symptoms. The total number of visits recommended is determined for each individual based the findings of the Initial Root Cause Physical Therapy Evaluation hands-on clinical examination and response to treatment – which is completed during the initial in-person consultation – and any other health concerns. Dr. Bell and her team members cannot teach you any vestibular or balance exercises until BPPV is ruled out or completely cleared – which can be done in the first session about 85-90% of the time. Clearing BPPV takes 2+ sessions for 10-15% of patients and some patients are found to have refractory – or recurrent – BPPV. Many people do not need any exercises for a full recovery from BPPV. The need for exercises depends on the presence of any leftover symptoms of motion sensitivity, imbalance, or blurry vision with quick head turns. Keep in mind that patients with dizziness have an inner ear component about 45-50% of the time. There are multiple other causes of dizziness and vertigo that may be causing you discomfort, called non-vestibular causes. The most important part of determining the number of visits each patient needs is completing the initial comprehensive, detailed Initial Root Cause Physical Therapy Evaluation and hands-on examination to determine the extent of the problem list and identify the root cause(s) of the complaints. Some patients choose to purchase a package of single, two, five or ten follow up physical therapy visits to complete their rehabilitation and optimize their balance after the Initial Root Cause Physical Therapy Evaluation and Treatment is completed. Never heard of BPPV? Click here to learn more. What conditions does Dr. Bell specialize in treating? Dr. Kimberley Bell, DPT has consulted with thousands of patients with complaints of dizziness, vertigo, and imbalance. That is truly her gift and her clinical specialty. She wants to help you get your life back! Dr. Bell also has developed innovative treatments for headaches, foot neuropathy and age-related incontinence. In patients over 65 years old, her team is often consulted to evaluate underlying causes of unexplained repeated falls, fear of falling, general unsteadiness and chronic falls. For Medicare patients who require ongoing or extended physical therapy intervention, Dr. Bell and her team may be able to recommend physical therapy services that are appropriate and are covered by Medicare. She usually refer her patients to physical therapists that Dr. Bell has personally trained through her physical therapy continuing education courses and mentorship program. Her heart-centered, integrative approach also offers patient education and exercises for reducing stress, improving sleep quality and relieving feelings of worry, despair and hopelessness, that often co-occur in patients suffering with dizziness and vertigo. What kind of payment does Dr. Bell accept for her private consultation services and what are the prices? Cash, Check, Credit Card or Debit Card payments are accepted. The Initial Root Cause Physical Therapy Evaluation and Treatment with Dr. Bell is $595. Initial consultation with her Vestibular Team Leader Janet Troche, PT is $450. Physical Therapy in-person follow up visit options are ideal for patients who prefer hands-on, individualized and personalized rehabilitation in the privacy of their own home (or hotel room). Follow up Physical Therapy visits of 60-75 minutes in length are to be used within 45 days of the physical therapy evaluation. Due to California Direct Access to Physical Therapy Law, should follow-up appointments extend beyond 45 days from the initial in-person physical therapy evaluation visit, a physician referral for physical therapy must be obtained by the patient and he/she agrees that services will be paused until a physician’s prescription for physical therapy is received. All packages must be used within one year of purchase. If unused, pre-paid follow up physical therapy visits will expire at the end of the month one year after the date of purchase. If Physical Therapy goals are accomplished prior to completion of all physical therapy follow up visits in a package, all patients will automatically enroll in a Balance Optimization and Wellness program to prepare for normal aging. Post-care Phone Calls are available for Returning Patients who want to discuss their case further with Dr. Bell by phone. For returning patients who have not been seen in person for the last 6 months, or have a change in medical status like a hospital stay or surgery, a Physical Therapy In-Person Re-Evaluation is required to initiate a New Episode of Care. Returning patients who have been seen by Janet Troche, PT but are new to Dr. Bell will be billed Dr. Bell’s Initial Consultation rate for their first visit with Dr. Bell. Dr. Bell can accept HSA (Health Savings Account) or FSA (Flexible Spending Account) debit cards. To review our payment policy, click here. Why doesn't Dr. Bell accept health insurance? Dr. Bell offers a unique service specifically for people with dizziness, vertigo and imbalance. In order to support the excellent clinical outcomes that her private patients frequently enjoy, she and her team members must spend time with the patients to learn all the details of their case and complete a complex hands-on examination during the initial visit, along with a treatment and extensive education. Unfortunately, due to declining health insurance payments and increasing insurance paperwork burden, healthcare providers who accept health insurance are not able to spend as much time with their patients as Dr. Bell and her team require for their services. Keep in mind that the average patient with vertigo sees 4-5 different doctors and spends $2,000 just to get an adequate diagnosis. They are often subject to unnecessary diagnostic testing, sometimes take inappropriate medications and suffer from delays in care for weeks to months, even for years. Many people never discover the root cause of their symptoms due to inadequate diagnosis, reliance on diagnostic tests and ineffective treatment efforts leading to mismanagement of their case. 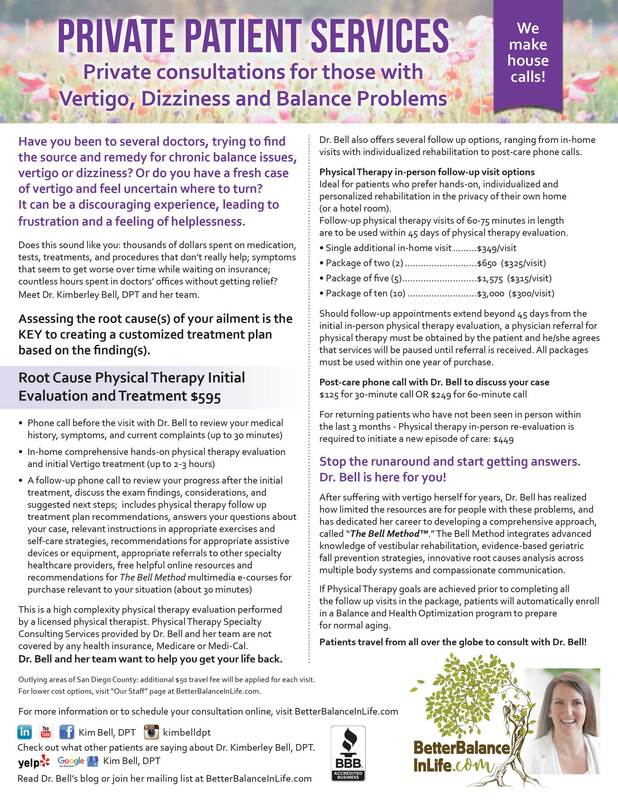 Dr. Bell offers her initial Root Cause evaluation and treatment session plus an introductory call and a follow phone call for $595 and her Team Leader offers an initial consultation for $450, which are both significantly less than the $2,000 an average patient with vertigo spends just for an adequate diagnosis. Many spouses and caregivers have to take off work to drive their loved one to the clinic or to get the diagnostic tests, but Dr. Bell and her team deliver your care right to your front door. If you want to use your health insurance, there are other providers who will accept your health insurance. You can find them at Vestibular.org. Many patients tell us they find that insurance-based healthcare providers do not have adequate time to thoroughly review their history or to assess them in detail for root causes of their complaints, much less provide personalized education and recommendations for optimal outcomes. When making your decisions, it is recommended to check your deductible and co-pay or co-insurance, as many health care plans have high out-of-pocket costs for covered services. If you have already consulted with all the experts who take your health insurance and are still suffering, don’t give up hope. Dr. Bell and her team are here for you. A comprehensive hands-on clinical exam by a skilled Vestibular Expert clinician is shown to be superior to MRI and other diagnostic tests under many circumstances. What if I can't afford to hire Dr. Bell right now? Join our mailing list so we can send you free, helpful information and notify you when Dr. Bell has created multimedia resources for you that are lower cost. She and her team are working hard to meet your needs. Dr. Bell understands that many patients who suffer with dizziness and vertigo are unable to work full time and have financial difficulties. Visit the Vestibular Disorders Association at vestibular.org to find another vestibular provider in your area. Ask your friends and family to donate to your consultation fee. If you still suffer after you have seen another vestibular provider, you can hire Dr. Bell in the future when you have the resources. Dr. Bell’s Team Leader, Janet Troche, PT offers lower cost visit rates to give you a less expensive option. Will I be able to talk with Dr. Bell after the consultation if I have questions? Will consulting with Dr. Bell be the "final step" in my recovery from my uncomfortable symptoms? It depends. Everyone is different, so the answer varies between individuals. For some patients, this consultation is the final step in their recovery and they are able to enjoy a complete recovery after consulting with Dr. Bell or her Team Leader. Other patients require physical therapy follow up visits to optimize outcomes and/or consultations with additional specialty healthcare providers. Since the service is unique and personalized, your Vestibular Expert Physical Therapist will review your prognosis, considerations, suggested next steps and any additional care you may need once your Initial Root Cause Evaluation and Treatment is completed. If I travel to San Diego to for the Initial Root Cause Physical Therapy Evaluation and Treatments, what are your travel recommendations? If you are traveling to San Diego, you may want to fly into the San Diego airport. International patients usually fly into LAX and drive south to San Diego in a rental car. Dr. Bell requests that you reserve your stay in the coastal area of northern San Diego County near the beaches of Carlsbad, so that you are within five miles of Moonlight Beach in Encinitas, California. She recommends that you plan to stay for at least three days to allow for follow-up visits and/or further evaluation by another local provider if you have multiple causes of dizziness. Many patients are able to deduct their travel costs to San Diego as a “medical trip” on their tax return. Dr. Bell recommends for you to discuss that option with your Accountant. Please note: San Diego County has a high volume of summer tourists so hotel and flight prices are the most expensive from May through September every year. What if I don't live in San Diego and I am unable to travel to San Diego? Dr. Bell and her Team Leader offer house calls for private patients only in San Diego, California. For patients traveling from out of town, Dr. Bell or her team member will make the in-person visit in the hotel room or bed & breakfast. Patients who are not able to travel to San Diego, California, may choose to involve their physician, physician’s assistant, nurse practitioner, physical therapist or occupational therapist in a professional consultation with Dr. Bell. Dr. Bell mentors healthcare providers across the US and currently consults with healthcare providers worldwide on their most complex cases of patients with dizziness, vertigo, imbalance and unexplained repeated falls. Join our mailing list so we can send you free, helpful information and keep in touch with you. If I contact Dr. Bell via email, will my personal health information be protected? In-person consultation is recommended to ensure the protection of your personal health information. Email communication is not secure and can be intercepted by a third party. All private patients complete an email consent form during the New Patient Intake process in order to allow communication with our team via email. You may feel that you are at the end of the road with no hope. We are here for you! With Dr. Bell’s wisdom, guidance and compassion, you may be able to live a beautiful life, better than you can even imagine. To read more testimonials from private patients and caregivers who have worked with Dr. Bell and her team, click here. “I’m done with the doctor who takes my insurance but only spends five minutes with me. “This changed my life! NOBODY had ever even CARED about my Vertigo before, let alone tell me they could help me. “During her evaluation, I felt completely confident in her ability even though some parts of the process were necessarily, disorienting. She offered continual education and reassurance. While I was working with her, I felt I understood every step of the process. “She was very present, kind and convincingly capable of solving my problem. Dr. Bell is a doctor I can trust – I trust her skills and caring. I highly recommend her services to others suffering with vertigo, without a question or hesitation. Admit the frequency of unsteadiness, loss of balance, and bumping into things. “She is passionate about helping people, inspirational and personable! “Dr. Kim Bell is an excellent clinician! She is very compassionate, caring and really spends time to determine the root cause of dizziness and vertigo of her patients, and effectively designs a treatment plan. I had a car accident 9 years ago and had on and off dizziness since then. I was seen by different doctors and had taken medications but my dizziness did not go away. Dr. Bell was able to identify and solve the missing piece of the puzzle and has helped me tremendously! I have also seen how her skilled interventions improved the quality of life of other patients. “She helps people all over the country and internationally. She has helped me a lot and I am very grateful for her work, her professionalism, her caring, and her warmth.